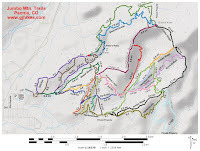 The Gully trail is part of the Jumbo Mountain Trails System in Paonia, Colorado. 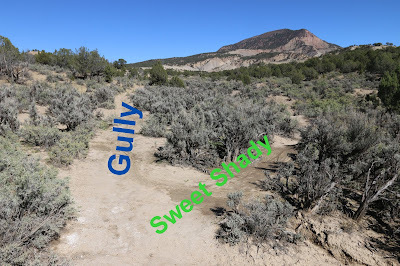 It begins off of the Sweet Shady trail where it travels up the drainage along the north side of a deep gully until it reaches the Pipeline Road. A few yards before reaching the Pipeline Road there is a spur trail that makes a steep climb up to the Elitches trail. To get to the trailhead head east on 3rd Street in Paonia and turn left onto Rio Grande Avenue. Follow Rio Grande as it crosses the creek and turns into Pan American Avenue and begins climbing the hill. The trailhead is at the end of Pan American Avenue. There is only room for a handful of vehicles to park at the trailhead but there is additional parking at the bottom of the hill at the Apple Valley Park where there is also a restroom. The Gully trail begins off of Sweet Shady just past the quarter mile point from the trailhead. The singletrack trail has an adobe base that balls up on boots and mountain bike tires when it gets saturated with water. When the adobe is dry it packs into a nice firm trail. Stay to the right at the fork that comes up that is less than 400 feet from where the trail began. 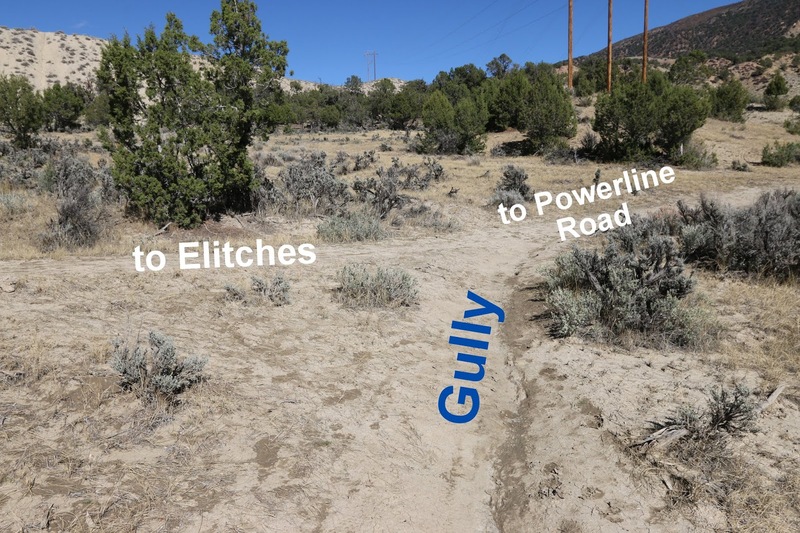 Going to the left leads up to the Elitches trail. 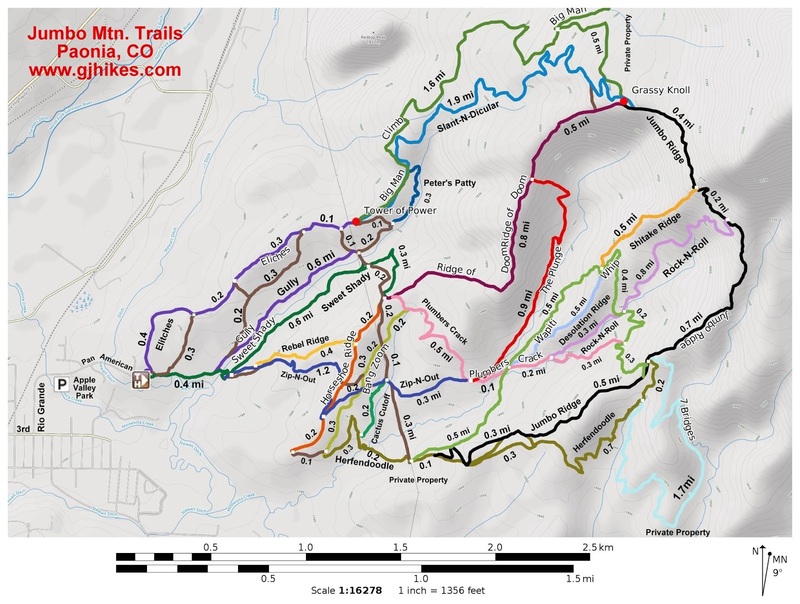 Hikers and folks that are out walking their dogs often make use of that trail to make various loops that lead back to the trailhead. The Gully trail trends uphill going in this direction gaining about 150 feet from one end to the other. Along the way it crosses several small washes. We've seen older maps that label this route as the North Gully trail and the Sweet Shady trail on the other side of the wash as the South Gully trail. Another fork comes up just before the Gully trail reaches the Powerline Road that also leads up to the Elitches trail. That spur is only a little over 500 feet long but it makes a pretty steep climb to get up to the ridge. Continuing on the Gully trail it quickly reaches the Powerline Road and comes to an end. Going to the left at this point will also lead up to the ridge where the Elitches trail begins but it takes a more gradual approach that is much easier. 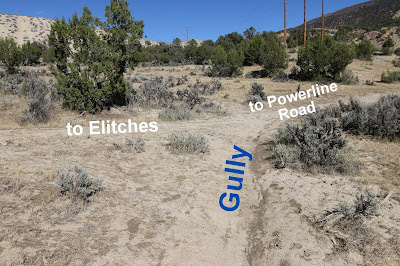 Going to the right the Powerline Road crosses the gully where you can pick up the Sweet Shady trail once again and either loop back to the trailhead or venture off on one of the other trails in the area. As far as the Gully trail itself goes if you would like to see it for yourself then all you have to do is grab your bike or 'Take a hike'.